Buses at the royal wedding, and the e-bus revolution. 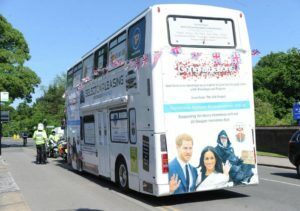 This is SFIK the first royal wedding to feature buses. Oprah Winfrey, Serena Williams and the noisy cast of Suits took up the option of the bus transport to the Harry-Meghan extravaganza provided by Kensington Palace. (Buses are surely an important cultural and political reference to black Americans.) They must have saved quite a bit on taxis, as prices were no doubt gouged on the day. Meanwhile, the Thames Valley plod* impounded a bus used by an NGO to offer shelter to homeless people in Windsor. Can’t let sordid reality spoil the careful constructed image of multicultural bliss. I can’t find a photo of the guest buses, so the homeless one gets the RBC nod. A-list celebrities are exquisitely sensitive to subtle shifts in style and taste. Is the humble proletarian bus making a social comeback? If it does, it will probably be on the back of electrification. Electric buses are much quieter and smoother than diesel ones, as well as non-polluting. The market is growing fast, led by China’s 100,000 a year (ca. 20% market share). 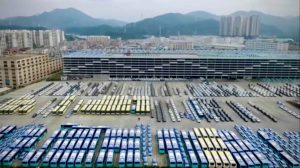 Shenzhen, part of the Pearl River megalopolis and home to leading manufacturer BYD, already has a 16,000- strong all-electric fleet, a small part of which is pictured here. Cities and other bus operators outside China are beginning to place serious orders, after several years of messing about with small trials. London; Nottingham; Oslo; Hamburg; Los Angeles; Schiphol and LAX airports. That’s a very incomplete list, the bandwagon is rolling. 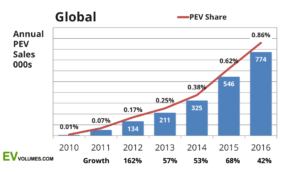 San Francisco, promising an all-electric fleet by 2035 with first orders only in 2020, comes across as a greenwashing shilly-shallier. distances covered. Using the same battery price projections as in the upfront cost analysis, we estimate that the TCO for the most expensive e-bus configurations – the 350kWh e-bus coupled with slow charging at the depot and the 110kWh e-bus coupled with wireless charging – will reach TCO competitiveness with a diesel bus as soon as this year (2018). Buses are just now as important as cars in the overall battery market (BNEF, page 21, Figure 10). So for Hizzoner or Herroner at City Hall, and the rival politicians seeking to supplant them, buying electric buses is a free move. It gains green cred with voters, for real not phony reasons, and it doesn’t cost anything using sensible accounting. And the riders and drivers get more comfort and less vibration and noise. *Plod: Br.E. informal: a police officer; by extension (“the plod”), the police force. Probably from the character PC Plod in the successful Noddy children’s book series by Enid Blyton, 1950s. The dematerialisation of growth seems to be on track. Are we doomed to drown in stuff, or run out of the raw materials to make it? After the midwinter potlatch I was ready for some good fire and brimstone on this well-worn theme. George Monbiot is usually a reliable Savonarola, but I found his latest Christmas diatribe against growth and consumerism disappointing. 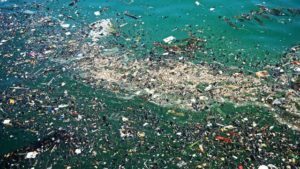 Personally, I’d have gone with the Great Pacific Garbage Patch, now twice the size of France. [Update: you can of course follow her on Facebook.] The trouble with anecdotes, however stomach-churning, is that they don’t tell you anything about the trend. Are Monbiot’s ghastly examples typical, or the reflection of the fact that most middle-class people in rich countries already have all the material possessions they need and most of what they want? In that environment, finding affordable presents the recipients will actually like is getting harder and harder, before we finally stop the pointless exercise. 1. The material intensity of world GDP has been going down. 2. It is still coupled to GDP, and there is no complete dematerialisation of growth. So far so so-so. Wiedmann’s data stop in 2009, and he hasn’t updated yet. 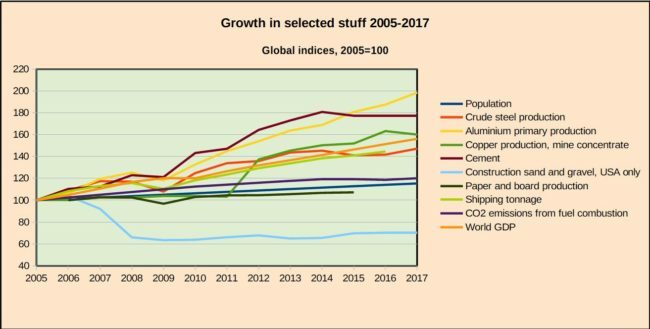 To fill the gap, Monbiot pointed to a new paper by Australian economist James Ward et al, purporting to show that decoupling of economic growth from material inputs is an illusion. IMHO this is question-begging hothouse orchid-growing; a wearisome takedown below the jump. This clearly suggests that the partial decoupling established by Wiedmann has got stronger recently. The inflection seems to have happened around 2013. This is pretty crude, but it tells a clear story. Raw materials only lagged GDP by a little up to five years ago. Since then – and without any global recession – they are running at about half of GDP growth, and only a little faster than population. There is just one outlier in my basket, aluminium, which is still replacing steel as lighter and more durable. We have not yet quite reached Peak Stuff. But the strong dematerialising forces that created the moderation are still at work. It is a reasonable hope that we will pass the peak in the coming decade. Long comment on the James Ward paper below the jump. Massive carbon sequestration: we will have to do it, and it’s feasible. The Paris Agreement includes in Article 2.1.a an alternative 1.5C target for global warming, as an aspiration. The IPCC has been tasked with preparing a special report on what this target implies. Somebody with political guile leaked an early working draft of the summary for policymakers of the report. This has interesting things to say on sequestration, page 18. 3.5 All mitigation pathways compatible with limiting global warming to 1.5°C by 2100 involve removal of CO2 from the atmosphere. […] The total amount of CO2 removal projected in 1.5°C pathways in the literature is of the order of 380-1130 Gt CO2 over the 21st century. Converting from CO2 to carbon (the ratio is 3.67, from the atomic weights in the molecule – no guesswork here), we get a wide range from 104 to 308 Gt carbon. 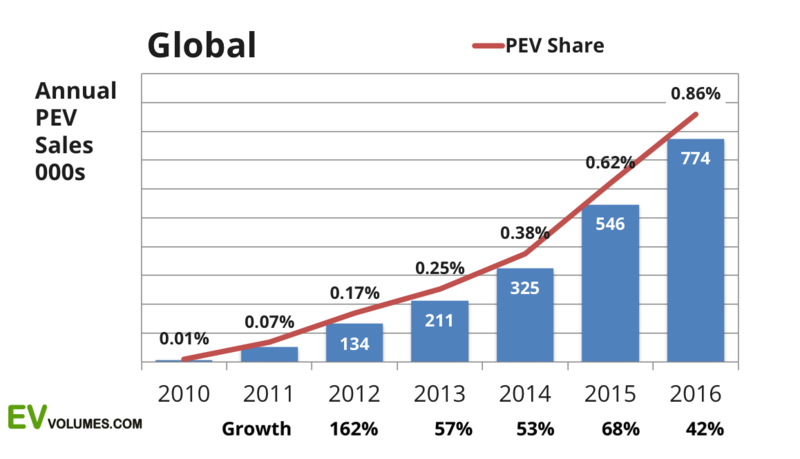 Annual emissions today are about 9 Gt. Suppose we allow ourselves 50 years for the task. Assuming that 1.5 degrees becomes the policy goal, we will have to bury 2 to 6 Gt a year. Ouch. BTW, we should convert to carbon. Nobody can imagine a tonne of a gas, but carbon is a solid. A tonne of carbon in coal is for instance typically 1.2 m3. Using my proposed journalistic unit of the Cheops (the volume of the Great Pyramid at Giza), the sequestration effort will be from 1,000 to 3,000 pyramids’ worth. Every year. There is a one-stop miracle fix. From 1 January 2020, just say to all fossil fuel companies, in the spirit of the Spanish proverb: “Take what you like, said God. Take it, and pay for it”: anyone can emit as much CO2 as they like, but must put it back within ten years. No pesky negotiations over the carbon tax are needed. Simple! The FERC rejection of Perry’s coal proposal as an example of the general incompetence of the Trump Administration. We have ended the war on American energy â€” and we have ended the war on beautiful, clean coal. The past tense is a nice touch. Like Napoleon returning to Paris from Egypt, he just declares that defeat is victory. Candidate Donald Trump promised not only to stop the decline in coal mining jobs but to bring lost ones back. This wasnâ€™t a casual campaign lie, like support for LGBTQ rights, abandoned from the inauguration. Trump, Pence and Cabinet members repeated the promise after the election, for instance in May. The promise was critical to securing votes in rural counties in Pennsylvania. It was part of the wider narrative of support for the white American working class, which won him crucial defections from the Obama coalition in Michigan and Wisconsin. This was a central Trump commitment. How is it working out? The increase came entirely from exports. French nuclear power stations had unexpected maintenance issues. Chinese planners miscalculated and shut down dozens of small coal mines ahead of the trend fall in consumption, which surprisingly ticked up too. These are just blips. 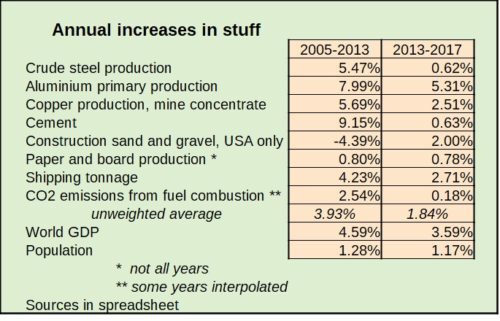 The world trend in coal is steadily down, and imports are vulnerable everywhere.Â Continued export growth is most unlikely. US consumption, the only solid basis for American coal mining, fell by 2.6%. As LCOE values for alternative energy technologies continue to decline, in some scenarios the full-lifecycle costs of building and operating renewables-based projects have dropped below the operating costs alone of conventional generation technologies such as coal or nuclear. This is already happening in Texas and Colorado. It doesn’t look as if coal closures will stay as low as 10 GW a year, or the industry survive 30 years. No US coal plant is safe for long, ergo no coal mine or mining job. This has nothing to do with the suspended CPP, a paper tiger, which basically put a diplomatic gloss on current economic trends. The European Parliament is about to decide whether to stop counting forest biomass as a “green fuel”, that is, fuel having no global warming impact, and restricting that status to residues and wastes. This is important because their current rules do not assign a carbon cost to whole trees harvested for fuel and burned.Â The theory behind the current rule is that the tree got its carbon from the air, but it’s deeply absurd; coal got its carbon from the air too. Forests store a lot of carbon, and putting it into the atmosphere is very much like burning fossil fuel; trees may be replanted and then may be allowed to regrow and recapture carbon, but for the decades that takes, the carbon from the harvest is in the air warming the planet. Do you live in the EU? Know people who do? Find your MEPsÂ here and give them a heads up, as the authors of the letter at the bottom of this page have done. This is important. Indian coal offers a nice moment of Popperian falsfication. Daniel Kahneman has a simple explanation why we donâ€™t think things through: laziness. Itâ€™s no work to rely on the sloppy, but fast and efficient, Hare mental system, using short cuts and stereotypes to get a response that is, under the current US President, good enough for government work. Rigorous thought is hard. Karl Popper offered a short cut through the hard part that is still rigorous: falsification of hypotheses. One false prediction and youâ€™re out. A nice idea, but it rarely works. You can save almost any hypothesis with tweaks, including Ptolemaic astronomy. So itâ€™s back to comparing the best shots of the competing hypotheses, hard work again. Just occasionally, life presents us with a simple Popperian test. Here is one I spotted, on the recondite but important subject of Indian coal burning. There are two entrants. Goliath is the IEA, a stuffy but reputed intergovernmental policy and data shop in Paris. David is IEEFA, a small energy policy think tank in Cleveland. 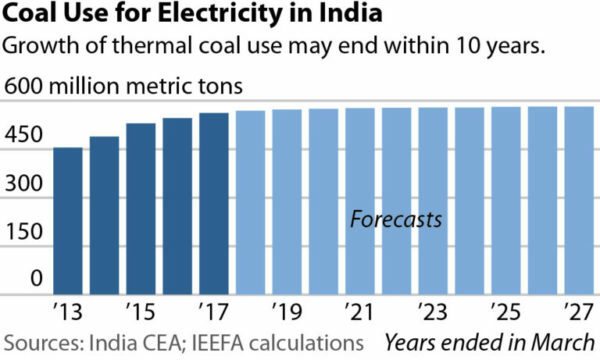 The positive IEA outlook for coal demand through 2020 is based in part on growth in India and Southeast Asia that will more than offsetÂ structural declines in Europe and the United States. The headline to the chart understates the predicted change: growth will be trivial after next year. This means that Indiaâ€™s overall carbon emissions may stabilise in less than a decade, assuming the electric transition goes as fast in transport as the government plans. Beginning Sunday, the biggest tobacco companies in the U.S. will start running an advertising campaign highlighting the health risks and addictive nature of smoking tobacco.Â The campaign is the result of a judicial order entered in 2006 in the case of U.S. v. Philip Morris USA, Inc., 449 F.Supp.2d 1 (D.D.C. 2006). The opinion, with the table of contents, runs 1,682 pages. I will not pretend that I have read even one-tenth of the opinion. However, I did read the introduction. I have posted the table of contents and the introduction in which I have highlighted two long passages, the first in green beginning on pdf page 33 and the second, highlighted in blue, beginning on pdf page 37. Here, I will only address the passage highlighted in blue. The passage illustrates how, even in the course of litigation, the tobacco companies played fast and loose with the truth, attempting to deny the reality of negative health effects from tobacco use. [S]everal observations need be made about witness bias and credibility. For the most part, each individual Chapter in the Findings of Fact explains why certain facts were found, why certain witnesses were credited, and why the testimony of certain witnesses was either discredited as just plain not believable or, in most instances, outweighed by other more convincing and credible evidence. Most of the witnesses whose testimony was most vehemently attacked by the Defendants . . .were only relied upon for undisputed or relatively insignificant background facts . . ., or testified about remedies which this Court could not consider on the merits . . . .
Much of the Defendants’ criticisms of Government witnesses focused on the fact that these witnesses had been long-time, devoted members of “the public health [and climate science] community.” To suggest that they were presenting inaccurate, untruthful, or unreliable testimony because they had spent their professional lives trying to improve the public health of this country [and doing scientific research] is patently absurd. It is equivalent to arguing that all the Defendants’ witnesses were biased, inaccurate, untruthful, and unreliable because the great majority of them had earned enormous amounts of money working and/or consulting for Defendants and other large corporations, and therefore were so devoted to the cause of corporate America that nothing they testified to, even though presented under oath in a court of law, should be believed. Such simplistic attacks on the credibility of the sophisticated and knowledgeable witnesses who testified in this case are foolish. All of this is not to deny that there were significant differences in the overall qualification of the Government’s witnesses and the Defendants’ witnesses. There were. The Government’s witnesses, viewed as a whole, were far more experienced, credentialed, and active in the area of [science and climate research], whatever their particular area of specialty, than were the Defendants’. Many of the Government experts had participated extensively, over many years, in the long and drawn-out process of ascertaining the consensus of scientific opinions . . . . Virtually every one had taught at a well-regarded academic institution and written numerous peer-reviewed articles in their particular area of specialty. Many of the Government witnesses continued “hands on,” [scientific research] in their fields despite heavy commitments for research, writing, teaching, and lecturing to their peers. The Defendants’ witnesses were obviously well educated in their areas of specialty. Indeed, as was mentioned on many occasions, Defendants even presented the testimony of an impressive Nobel Prize winner. However, rarely did these witnesses have the depth and breadth of experience of the Government witnesses. Many had worked only in large corporations, and many for only one or two such employers. Manyâ€”although not allâ€”had written relatively few peer-reviewed articles. Many of the highest paid experts of Defendants, while well credentialed in their particular fields, such as economics, presented relatively narrow testimony tailored to the particular problem or issue they were retained to opine on for purposes of this litigation. A few of Defendants’ experts had done virtually no individual research and written virtually no peer-reviewed articles, and a few were unfamiliar with the relevant facts and/or the major scientific literature on the issue about which they testified. While the testimony of each personâ€” expert or fact witnessâ€”was evaluated on its own merits, there can be no denying that, as a group, the Government’s witnesses were far more knowledgeable, experienced, and active in their respective fields. Our 1970 public opinion survey showed that a majority (52%) believed that cigarettes are only one of the many causes of smokers having more illnesses. It also showed that half of the people who believed that smokers have more illness than non-smokers accepted the constitutional hypothesis as the explanation. Thus, there are millions of people who would be receptive to a new message, stating: Cigarette smoking may not be the health hazard that the anti-smoking people say it is because other alternatives are at least as probable. The Roper Proposal would be a persuasive (if not strictly scientific) medium for this message. Put the Panzer quote into the context of 2017 and the war against climate science: There are millions of people who would be receptive to the message that: Green house gases and global climate change may not be the hazards that the scientists people say they are because there are other alternatives that are at least as probable. This would be a persuasive (if not strictly scientific) message. P.T. Barnum may or may not have said “There’s a sucker born every minute.”Â But it’s true enough. Are carbon emissions rising again? Yes in 2017, but I think it’s a Chinese blip. Yes, according to the top-ranked people at the Tyndall Centre, as reported in a string of journal reports, the key letter here. They predict global carbon emissions will rise 2.0% in 2017, after three years on a plateau. They do not offer a prediction for 2018, but are not optimistic. 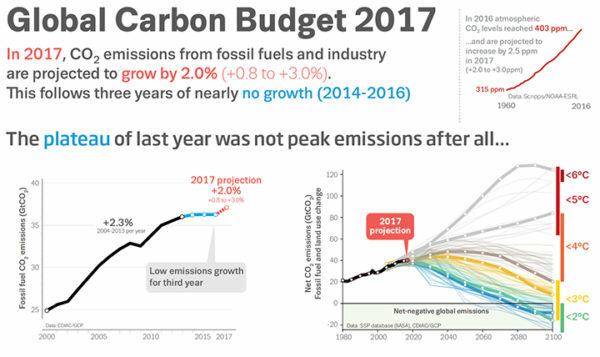 Author James WimberleyPosted on November 16, 2017 November 16, 2017 Categories Energy & The Environment, International Affairs6 Comments on Are carbon emissions rising again?